U2 fans gathered in their flocks to see the Northside Dublin rockers come home for a four night stint bringing with them their ‘Experience + Innocence’ tour to the 3 Arena, following two nights in Belfast’s SSE Arena. The tour kicked off in May this year and comprised of 60 concerts across North America and Europe from Las Vegas, Lisbon and Copenhagen to Chicago, Berlin and London. Back in September Bono had to cut two concerts short because he had lost his voice from overuse. The setlist was mostly songs from the latest album ‘Songs of Experience’, but featured their biggest hits Vertigo, Elevation and Pride and one. Bono made reference to the band meeting as teenagers and recalled one of their first performances at The Baggot Inn and how the lads were gutted they never got signed as a result. President Michael D Higgins and his wife Sabina were in attendance the first Dublin night. Also in attendance were Woody Harrelson and his comedian friend Kevin Bridges. During a performance of ‘Beautiful Day’ on the first night, Bono gave Woody a shout-out. There was no supporting act for the foursome on any night of the Irish leg of the tour. In 1987, the album ‘The Joshua Tree’ launched them into stardom as the biggest band in the world. Thirty-one years later, it feels as though they got the homecoming they wanted in their hometown. Throughout the set, every member of the band was behind giant pixelated images of themselves that blurred in between songs. Images of the band sat alongside images of Europe and pressing social issues. At one point on one of the screens, the audience were greeted by an image of Bono, and using facial distortion technology which looked like a snapchat filter, Bono turned into his devil alter ego Mr MacPhisto and candidly reflected on how stardom “expands and diminishes” the young man’s mind. Half of the audience reacted with cheer to all the imagery, the other half remained silent, trying to pay attention to the sound of the band and the strong political images they could see. The set-list accompanied by politically charged imagery made the entire concert feel like a campaign for Bono 2027. The massive production was incredible to say the least and there is no doubt that the band are better than ever. But with Bono full of dad jokes and more humble than ever, he was cascading, stripped down. The band have reached their peak. The show didn’t just entertain the audience but it provided an explanation of some sort. They are still trying to save the world. 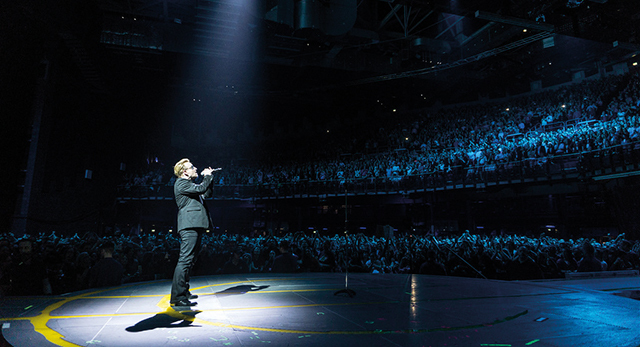 The band’s ego, mainly centralised by Bono, created a ripple effect on stage. The Guardian have described Bono as the “Samaritan who avoids the taxman”meaning he likes to keep his money offshore. The U2 that were met by the audience in the 3 Arena were the U2 from the 80’s but richer and influenced by this century’s technological advances. The U2 abroad are not the U2 at home. Towards the end Bono said: “I’m not little Paul Hewson from number 62, I’m Bono”.